In case you missed the signs, it’s pumpkin season! Some of you, I know, just squealed with glee. The rest of you flinched in horror. I get it! Pumpkin has become synonymous with overly sweet, overly spiced, overly orange. Never fear, this recipe is not one of those. The pound cake itself is dense and rich. The spice is subtle. The color is… naturally orange. It’s pumpkin the way it’s supposed to be. The way October and the Gods of Fall intended it to be. In fact, today, all across the internet, pumpkin recipes are going live as a part of the #virtualpumpkinparty, organized by Sara over at Cake Over Steak. So if you’re not pumpkin’ed out take a gander at the list at the bottom of the post because I think you’ll be pleasantly surprised by all the hats that pumpkin is wearing this season. Preheat the oven to 350F. Beat the butter in a large bowl and gradually add in sugar, beating until light and fluffy. Add the eggs, one at a time, whisking well between each addition. Add in vanilla extract. Sift together flour and baking soda into a bowl. Add to the egg mixture, one third at a time, alternating with pumpkin. Spoon batter into a greased 10″ bundt pan. Bake for 40-45 minutes, or until golden brown and firm. Allow cake to cool for 10 minutes before turning it out onto a plate. Whisk together milk, spices and sugar. Slowly pour the glaze evenly over the cake. Serve warm. Virtual Pumpkin Party 2015 Link List! pumpkin moon pies… for a virtual pumpkin party! 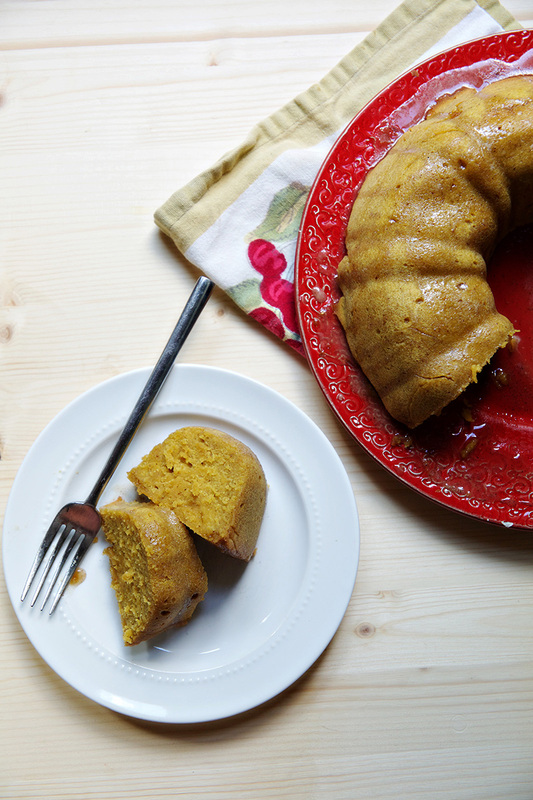 This pumpkin pound cake looks delicious! It would go perfectly with my coffee this morning! That looks like one fabulous pumpkin dessert! I love the idea of bourbon in the glaze. 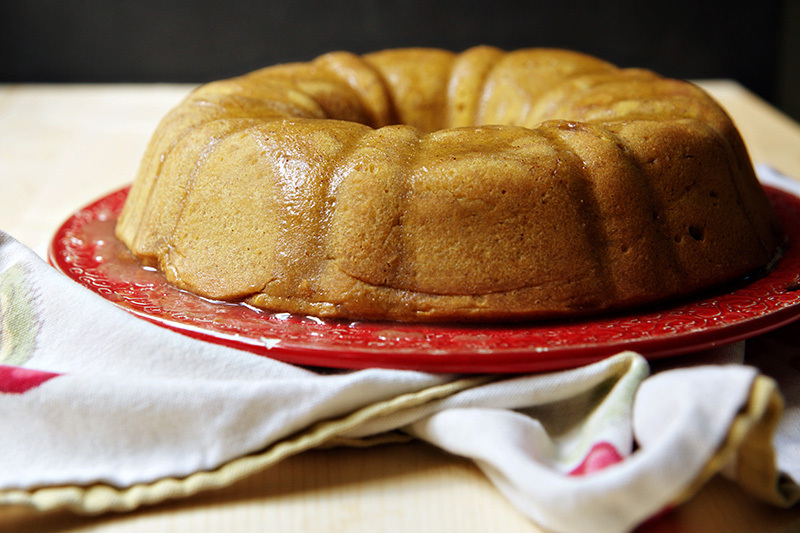 This pumpkin pound cake looks delicious. It is funny how pumpkin seems to divide the general public into love it or hate it camps, isn’t it? 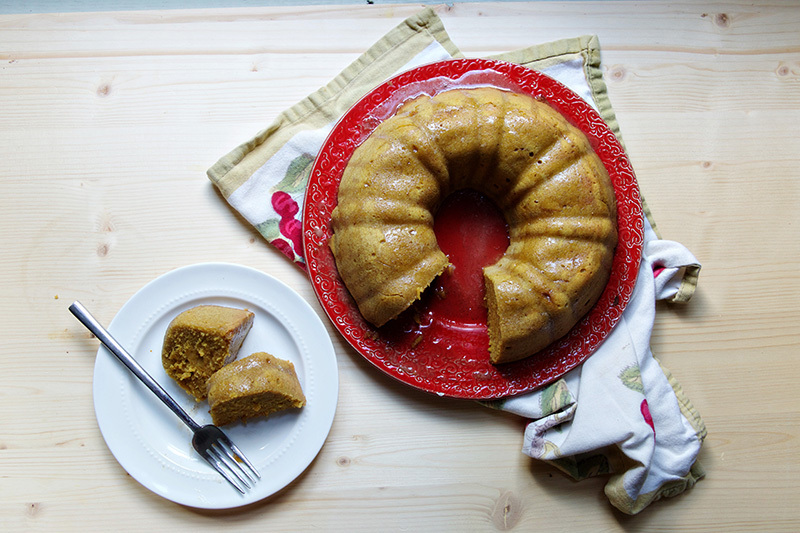 I’m fairly neutral, but I think this pumpkin pound cake would push me closer to the love it camp. It looks delicious! I’m such a sucker for pound cake. This looks so delicious! Girls,I feel sick of all the ordinary pumpkin recipes but this one got me amazed I used white chocolate when preparing the glaze for the cake and it was the best decision I have ever made in my cooking experience! Hope you will like my idea because I am really into this recipe! I love a good pound cake!! Thanks for joining in on the pumpkin fun. Pumpkin Ale Cake + A Pumpkin Party! Congratulations . My Grandma made them when i was 6 years old, maybe before 40 years. And she used the same recipe like yours. Thank you for returning this beautiful and delicious memory. Happy Holidays!